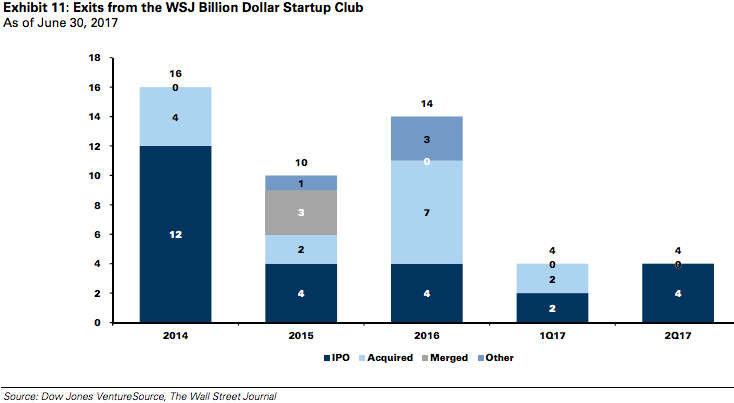 Highly-valued tech startups are going public at a pace not seen in three years. Four so-called "unicorns," or private companies valued at $1 billion or higher, completed initial public offerings in the second quarter. That was double what was seen in the first quarter, and equal to the number of unicorn IPOs for the entire year in both 2015 and 2016, according to data compiled by Goldman Sachs. It's worth noting that while Blue Apron's final valuation doesn't look particularly weak relative to its last private funding round, the company had a hellacious time going public. In the weeks leading up to Blue Apron's final pricing, retail juggernaut Amazon shelled out $13.7 billion to buy Whole Foods, which caused potential investors to consider the possibility of more competition in the food-delivery industry. As a result, Blue Apron took a cleaver to its IPO range, cutting it to $10 to $11 a share, down from $15 to $17. The company ultimately priced at $10 a share -- 40% below the maximum it had sought. The ordeal serves as a cautionary tale for other unicorns which may be considering a public offering. It shows that industries of all types can prove fickle to external pressures, and stresses just how important it is for companies to exercise caution when trying to time their IPOs. So what's next for the growing unicorn universe? After all, 13 new ones emerged during the second quarter, more than offsetting the four that went public. There are now 168 unicorns out there. The biggest single funding round for a software and internet company in the second quarter was a $400 million Series E for Houzz, a popular photo site used by homeowners to plan renovations. Other companies receiving considerable late-stage funding included Peloton ($325 million) and AvidXchange ($300 million), according to Goldman. 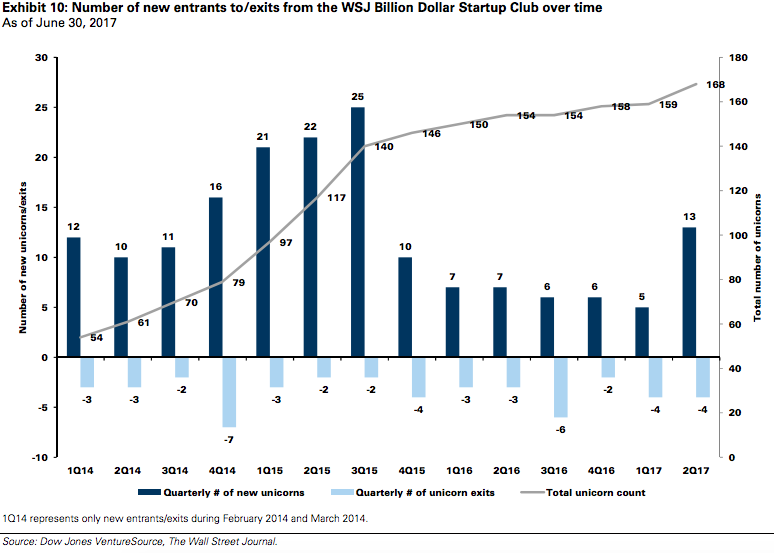 The number of unicorns has increased or remained flat in each quarter since the start of 2014. Goldman Sachs.